A nurse driven quality improvement project improved catheter utilization rates in one hospital. A urinary catheter insertion decision tree provided alternatives to indwelling urinary catheterization. The decision tree allowed nurses the autonomy to operate to the top of their scope of practice. To address CAUTIs at Sentara Healthcare, an initiative was implemented to standardize appropriate indications for temporary urinary catheter insertions using the electronic health record. The indications for temporary insertions were based on guidelines from the Centers for Disease Control and Prevention’s Healthcare Infection Control Practices Advisory Committee and the Association for Professionals in Infection Control and Epidemiology. Around the same time, Sentara Obici Hospital conducted a quality improvement (QI) project to reviewCAUTIs by insertion indication, explore alternatives to placing a catheter for that indication, and develop a plan for standardizing care. As part of the systemwide initiative, all providers were required to choose from a standardized list of appropriate indications when they ordered a temporary urinary catheter. This practice allowed the auditors, who were also members of theQI project task force, including nursing leadership (the chief nursing officer and unit managers and bedside nurses), to easily identify the original reason the catheter was inserted. 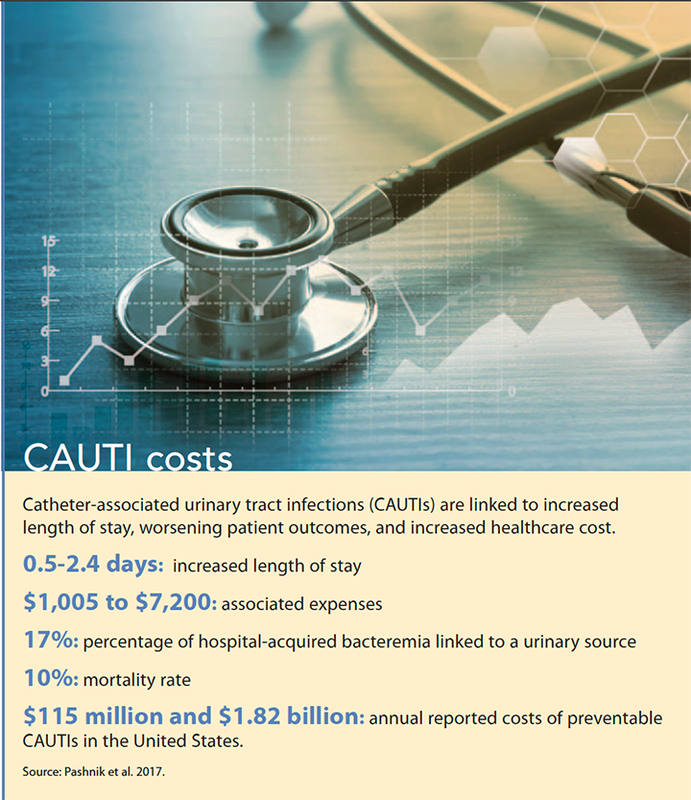 As the QI task force examined CAUTIs by indication, we discovered that most of the patients who developed infections had the catheter placed for urinary retention or strict intake and output. Our team questioned whether any alternatives to inserting an in dwelling urinary catheter were available for these indications. Literature, including the American Nurses Association’s (ANA’s) Streamlined Evidence-Based RN Tool: Catheter Associated Urinary Tract Infection (CAUTI) Prevention, recommends some alternatives by indication. The ANA tool (download at tinyurl.com/y8rz6j85) focuses on broad practice strategies to reduce CAUTIs (fewer catheters used, timely removal, and insertion maintenance and post removal care), and many of these strategies had already been implemented with great success in our facility. 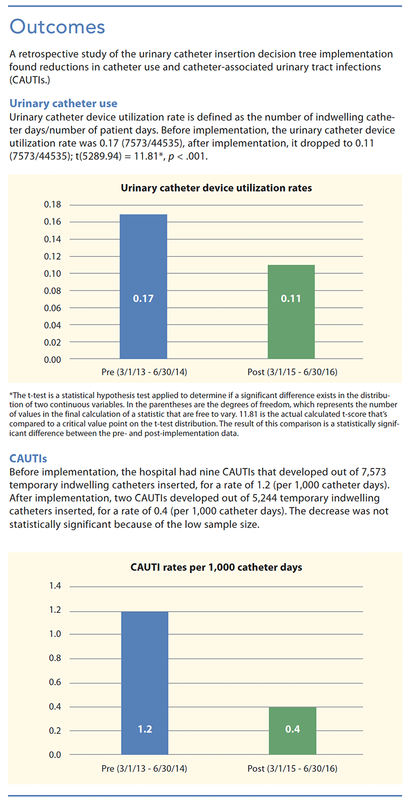 In our effort to proactively reduce CAUTIs, we decided to build on the ANA tool and focus on using fewer catheters. We started our effort by polling bedside nurses and staff urologists for ideas about how we could reduce catheter insertions. After many alternatives were discussed and refined, we developed a urinary catheter insertion decision tree in the form of an algorithm to provide clinicians with alternatives to placing a catheter based on the indication. 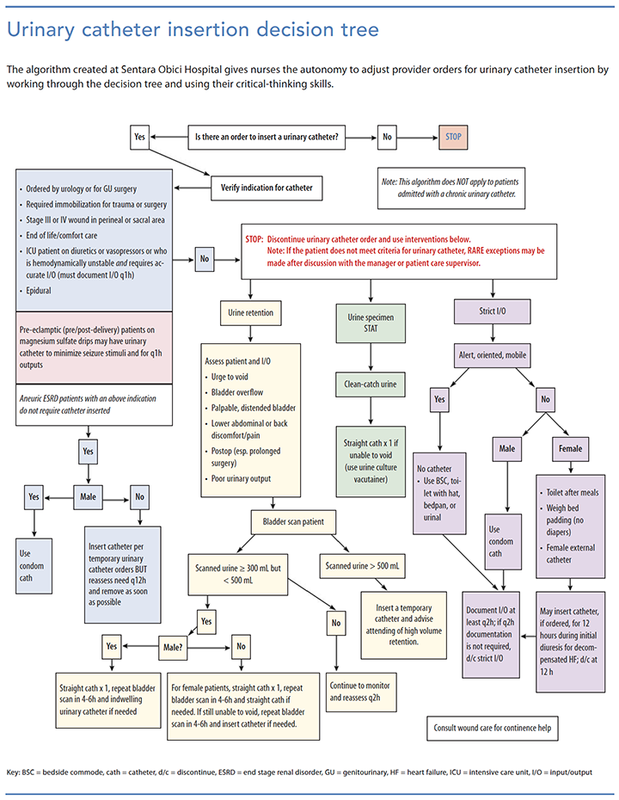 (See Urinary catheter insertion decision tree.) We presented this algorithm to our medical staff executive team, which approved the protocol, giving bedside nurses the autonomy to use these alternatives instead of inserting an in dwelling urinary catheter even if a provider ordered one. Using the algorithm, nurses are encouraged to provide care at the top of their scope of practice, working through the decision tree for alternatives to the specified indication. For instance, if the patient has a catheter order for urinary retention, the nurse assesses for urinary retention (presence of bladder distention, evaluation of the patient’s intake and output, signs of urine leakage), uses a noninvasive bladder scanner to determine the current urine volume in the bladder, and then makes the best clinical decision for the patient about the necessity for the catheter. In January and February 2015, Sentara Obici educators trained staff nurses, which included one-on-one hands-on training and a “frequently asked questions” tip sheet with different scenarios to guide nurses in their critical thinking. The algorithm went live in March 2015. During daily rounding and huddles, nursing leadership focused on catheter insertion critical thinking and early removal of necessary catheters. By using the algorithm and evidence-based practices for catheter maintenance, the hospital had no CAUTI events from September 2015 to January 2017. To empirically evaluate the efficacy of the algorithm, the research committee, which included the authors and a bedside nurse, obtained institutional review board approval for a retrospective study. Implementing the algorithm, using noninvasive methods (condom catheters, bedside commodes with measurable collection hats, urinals, and bedpans) for accurate urine intake and output measurements, and avoiding in dwelling catheters unless medically necessary, Sentara Obici has reduced the incidence of CAUTIs. Allowing nurses the autonomy to operate to the top of their scope of practice and use their critical-thinking skills at the bedside has improved patient safety and outcomes. After the success of this QI project, the Sentara Healthcare System rolled out the urinary catheter insertion decision tree system wide in an effort to reduce CAUTI rates in all of its facilities. Lee Knill and Juanita E. Payne are hospital educators at Sentara Obici Hospital in Suffolk, Virginia. Ralitsa Maduro is a biostatistician at Sentara Healthcare in Virginia Beach, Virginia. Clayton JL. Indwelling urinary catheters: A pathway to health care–associated infections. AORN J. 2017;105(1):446-52. Magill SS, Edwards JR, Bamberg W, et al.Multistate point-prevalence survey of healthcare-associated infections. N Engl J Med. 2014;370(13):1198-208. Meddings J, Saint S, Fowler KE, et al. The Ann Arbor criteria for appropriate urinary catheter use in hospitalized medical patients: Results obtained by using the RAND/UCL Aappropriateness method. Ann Intern Med.2015;162(9 suppl):S1-34. Pashnik B, Creta A, Alberti L. Effectiveness of a nurse-led initiative, peer-to-peer teaching, on organizational CAUTI rates and related costs. J Nurs Care Qual. 2017;32(4): 324-30. Smith CV. On the road to zero CAUTIs: Reducing urinary-catheter device days. Am Nurse Today. 2015;10(1):46-8.